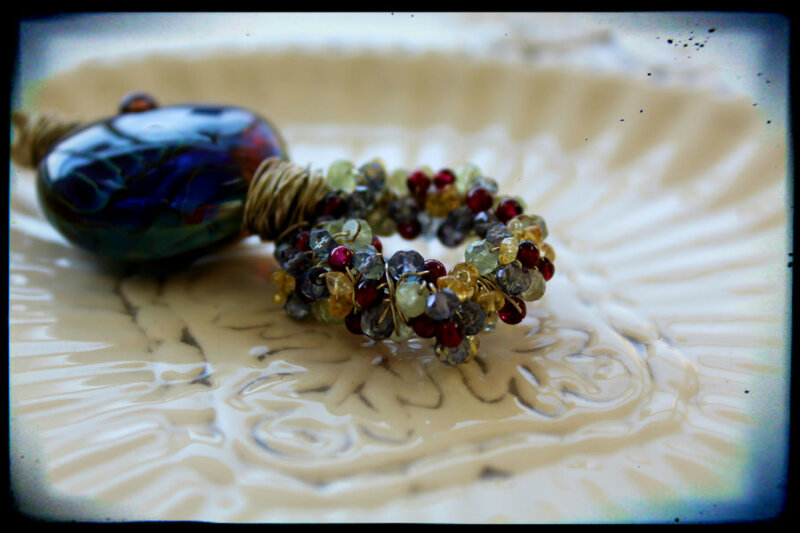 Pretty Things: Cup of Bead Soup Mini Blog-Hop with Lea Avroch! If you've been a follower of my blog, you're already familiar with my Cup of Bead Soup project. In 2011, I purchased beads, sight unseen, from various bead makers and tasked myself with creating things with components I didn't choose myself. It's been a fantastic way to push my design skills and break out of making the same old/same old. In essence, it was a one-woman-production of the Bead Soup Blog Party. I changed the process for 2012 to include three additional designers, the same set of beads, and made it a mini-hop. Each Cup of Bead Soup, you'll have the chance to sign up to participate and be chosen randomly. The Cup of Bead Soup has a fee associated with it that goes directly to the bead maker. 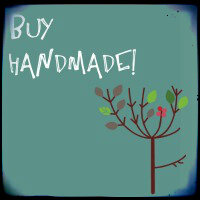 Support Handmade! Now let me tell you -- this is a LARGE bead -- 1.25" (31mm) in diameter. 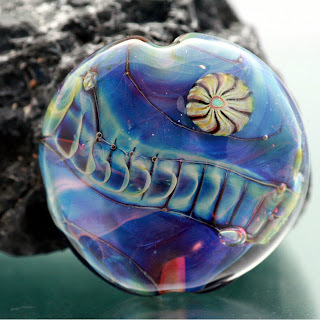 I know from my own paltry experience at lampworking that this sort of bead takes a lot of time to finesse. It's also made with a reactive glass which is a LOT more expensive than normal glass rods. However, sterling silver jump rings of this size and weight have made me shelve this design for a while, which is really too bad, as it was really popular. So let's try a pendant, something I don't often make. I pulled out 12-gauge sterling silver, and lady's and gentlemints, that is SOME sort of hard wire to bend and wrap, even at dead soft! Cripes. But I persevered, shot a piece of silver across the room when I cut it (reminder -- safety glasses for everyone within range), and made a wrapped loop, strung on the bead, and make a large loop beneath the bead. Next came the fun -- embellishing that silver loop. I decided on teeny tiny gemstones (and by tiny, I mean 2-5 mm). Citrine, phrenite, mystic topaz, and garnets, to be exact. I went for faceted rondelles, smooth rondelles, and smooth rounds for even more texture. I usually use 28-gauge sterling silver when I make intricate wrapped projects like this, but I didn't have any. I had just bought a roll of 26-gauge nickel silver from Fire Mountain Gems on a whim, and decided why not, let's try it. I'm happy to say it worked out well, although it was a bit stiffer than sterling. If you want to oxidize nickel silver, I've found my Liver of Sulfur doesn't work well but JAX Brown, which is usually for copper and what not, rocks. As you can see, I went to town wrapping a base and a cap out of the thin wire, and continued the texture by wrapping the wire around the bail. * Wrap the strung gemstones once around the wire base, and then come BACK in the other direction to fill in the holes. * You're going to have to work that thin wire between beads like dental floss between teeth sometimes. * It's going to look like a hot mess while you're working on it, but about halfway through, you'll start to see it all come together. And now see what the other designers made! with a lampwork bead set by Juls Cannon. I love the loop of gemstones! Nice touch for added detail. Your pendant is beautiful. I like how the colors of the gemstone beads complement the colors in the glass bead. Told you I would be here at midnight. Fantastic wire work. Knew you would do Lea proud. Hope you like mine. Wow - I really like this - so creative. Your designs are always so pleasing to the eye as well - love this pendant!! Those big pendants and that gauge of wire are so tricky to work with, sometimes! But you make it look so easy, friend! I love that pendant! There are so many options for stringing it depending on your mood. Dear Lord, Lori, where do you find the patience to do that wrapping?! It is a gorgeous piece - absolutely stunning! I love how you wrapped the beads onto the wire. They are a gorgeous mix of beads too..
That is quite lovely Lori! I am in awe of people who can work with wire- I love what you did with the little gems and wire!!!! I love your pendant!!! Looking at it is does remind me of beadweaving. I can't wait for your next cup of soup! Lori that is gorgeous! I love how you used all the smaller stones to bring out the colors in the focal - so pretty! 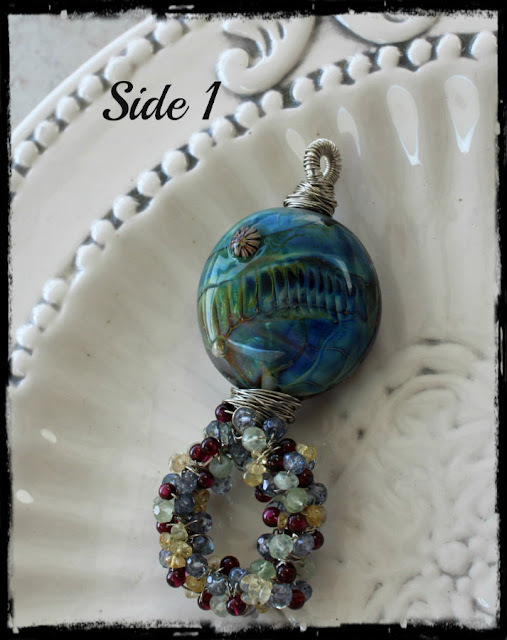 Those tiny wrapped gemstones really balance the colors, size and luminosity of the Lampwork bead beautifully! Love the wrapped gemstones. They just look rich! Beautiful job with her beautiful bead. I really like what you did with your bead. The colors are great and what alot of wire work there! I appreciate your explanation of products and design. I was wondering about that wire from Fire Mountain Gems. Very pretty! 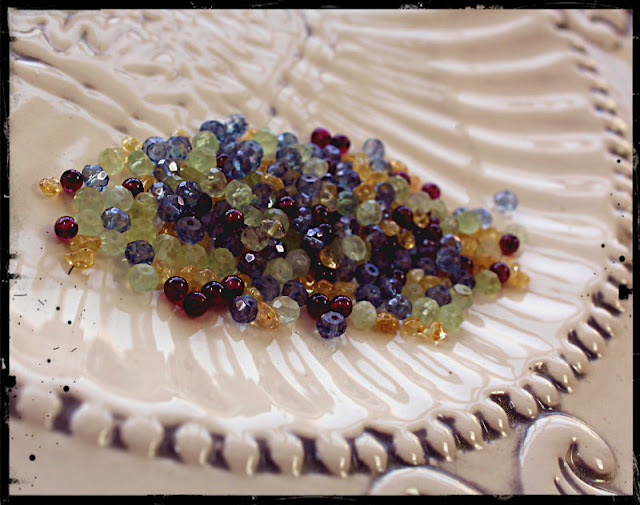 Very pretty, I love the sweet little gemstones that was inspired! Lori, I absolutely adore that pendant! So much fun! 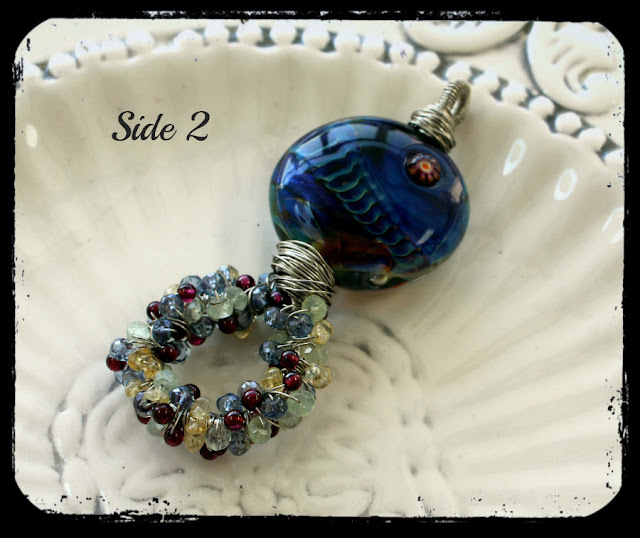 Your wire wrapping skills are superb and how generous of you to share your tips on adding the colorful loop of coordinating beads. I might just have a go of it myself. Thank you from the bottom of my heart for your generosity & for all you do & have done for the beading community. & now I'm off to finally see what the others have created as well. OMG! The focal glass bead is really a beauty! I'm in love with your necklace...and your bead pendent is just perfect! I love this idea, the "soup" idea and the finished piece. Very cool!!!! Love your creative spirit -- it's contagious and uplifting :)The "Cup of Bead Soup" is a great idea & lots of fun. I appreciate you sharing and celebrating the stunning bead created by Lea Avroch!! Wow, it is beautiful. I hopped here right at midnight, and now time to reflect on all the beauty: Lori, your pendant is amazing -- intricate, rich, complex, elegant, delicate, strong. Unique and exquisite jewelry art! And forgot the most exciting part for me as a designer -- love your chain maille jewelry!! 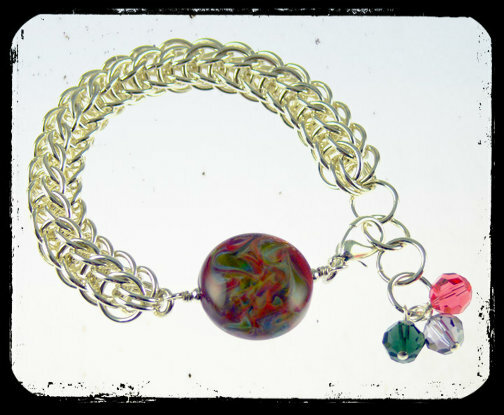 Wow, hope you bring your chain maille back with Artistic wire or copper ... it is lovely! I was so happy to be a part of this mini-hop. The bead from Lea is amazing and what you did with it is also amazing. I am really enjoying participating in these various challenges, not only has it stretched me creatively, I get to see other amazing designs, be inspired, and make new friends. WOW! I love the out of the box approach. The colors of the piece are so summery and fun. Beautiful.